An easement is the right to use another person's real property for a specific purpose. There are four ways to create an easement in Iowa: by an express grant or reservation, by prescription, by necessity, and by implication. Solar easements may also be granted in Iowa. To obtain such an easement, an owner of real property may apply to the solar access regulatory board for an order granting a solar access easement. The application must be filed according to 564A.4 of the Iowa Code. When any person is in the use of a way, privilege, or other easement in the land of another, the owner of the land in such case may give notice in writing to the person claiming or using the way, privilege, or easement of the owner's intention to dispute any right arising from such claim or use (564.4). The notice to prevent acquisition, when served and recorded as provided, will be an interpretation of such use, and prevent the acquiring of any right thereto by the continuance thereof (564.5). Similar to other real property interests, an easement must be signed and acknowledged by the grantor. The deed will not be deemed lawfully recorded until it has been previously acknowledged or proved in the manner prescribed by Iowa Statutes, chapter 9b. 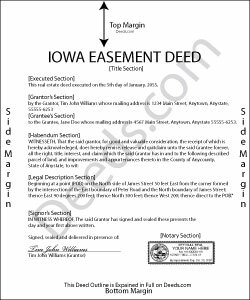 The acknowledgment of an easement deed, whether made within the state of Iowa, outside the state, outside the United States, or under federal authority, should comply with the provisions of chapter 9b of the Iowa Statutes. Notary acts in Iowa can be performed by any of the following: a notary public of the state; a judge, clerk, or deputy clerk of the state; a person authorized by Iowa law to administer oaths; any other individual authorized to perform the specific act by the law of Iowa; or a registrar of vital statistics or a designee of a registrar of vital statistics (9B.10). Notarial acts must be evidenced by a certificate, which must meet the requirements as listed in 9B.15 of the Iowa Statutes. Unless an easement deed is filed and recorded in the county in which the real estate is located, it will not be valid against subsequent purchasers for a valuable consideration, without notice, or against the state or any of its political subdivisions during and after condemnation proceedings against the real estate. An interest in real estate evidenced by a filed instrument will have priority over any lien that is given equal precedence with ordinary taxes, except for the provisions listed in 558.41 of the Iowa Statutes.